If it was as large as your living room, decorating your bathroom would have been a piece of cake. Unfortunately, bathrooms are almost always too small and don’t offer much in terms of space to work with. Or perhaps, that’s the common excuse most of us use for not paying that much attention to the details in this area of our homes. In reality, even the tiniest of rooms can be transformed into a functional and stylish space as long as you adopt the right decorating style. And when it comes to bathrooms and limited spaces in general, Scandinavian is a decorating style that always seems to work. Its minimalist, white-loving nature has all the tricks you need to refresh and visually enlarge your bathroom. Intrigued? 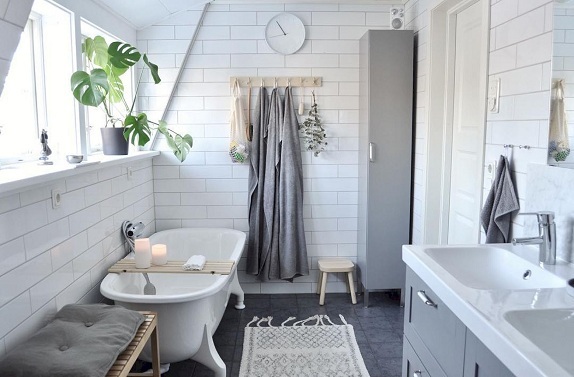 Here’s how to use Scandinavian style to transform your bathroom into the beautiful space it deserves to be. The main reason Scandinavian-inspired spaces always feel so fresh is that they utilize raw, natural materials. With that being said, the bathroom tiles should obviously be ceramic, while the bathtub, sink, and toilet made of rich marble. Not only are these materials sturdy and durable, but they’re also easy to clean – which is in line with the Scandinavian belief that all spaces need to be as functional as possible. But don’t overlook the bathroom accessories either. Soap dispensers, towel racks, brushes, and toilet roll holders should also be made of quality, natural materials such as marble, brass, or wood. In a Scandinavian bathroom, there’s no room for ugly plastic accessories! The unique colour palette Scandinavian style uses is another reason it feels so soothing. After all, with a space that’s mostly white, it’s hard to go wrong. Just imagine it – the pure white tiles, ceiling, and bathtub will gleam and bounce the light around, giving the impression of more spaciousness. However, this crisp, white background demands to be revived with hues of neutrals such as beige, brown, grey or dark green, or even pastels if you’re after a brighter feel. It’s best that you use brighter colours through smaller accessories such as toilet roll holders or brushes. The minimalist Scandinavian style wouldn’t be possible to achieve without the help of smart storage solutions. Try to think in all directions – up, down, and sideways. A medicine cabinet above the sink, a vanity below it, a few woven baskets on wall-mounted shelves – they can all be used to keep your bathroom essentials and small toiletries perfectly organized. When everything has its own exact place, it’s less likely that people will leave the bathroom in a mess every morning.